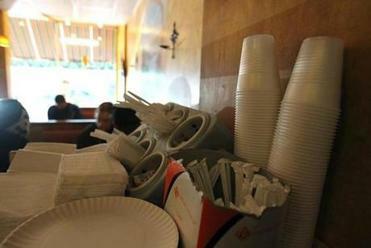 At Walden Italian Kitchen in Concord, bottled water is no longer for sale beside sodas and other soft drinks, but plastic cups are available for customers to get tap water. Nearly a month after a ban on the sale of single-serving plastic water bottles went into effect in Concord, all town businesses are complying with the new law except Cumberland Farms. 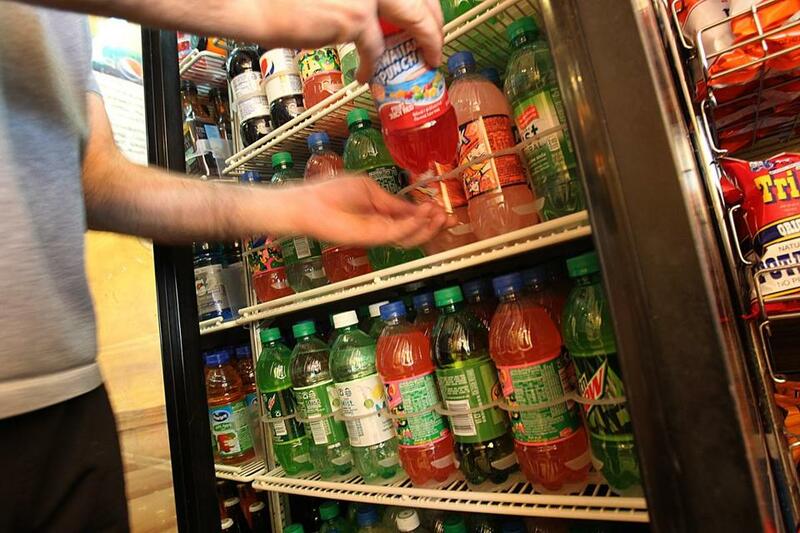 The convenience store on Thoreau Street is refusing to take bottled water off its shelves and has continued selling all sizes of bottled water. Concord’s public health director, Susan Rask, said she has visited the store three times and found each time that it was selling water in plastic bottles in violation of the bylaw. She first issued a warning followed by fines of $25 and $50. “They have told me they intend to continue selling water,’’ Rask said. Walden Italian Kitchen, a pizza place, says it has lost money and customers have complained. It has put plastic cups out for customers to get tap water. Town Manager Chris Whe­lan said he is working with the town counsel to determine the next step. “I suspect we’ll continue to issue citations and fines,’’ Whelan said. An employee at the Concord store referred all questions to the Cumberland Farms corporate office. The company did not return calls seeking comment; the company’s public relations agency said officials from Cumberland Farms were not available. Despite the ban, the store was selling individual and cases of single-serve bottles of water on Thursday. Since the bylaw prohibiting the sale of plastic water bottles 1 liter or less went into effect Jan. 1, Rask has checked between 120 and 150 local establishments and vending machines for compliance. She said 14 businesses were still selling bottled water after her first inspection but most were unaware of certain aspects of the law and have since complied. Some businesses, for example, stopped selling small water bottles but still had 1-liter bottles in stock. Rask said others thought they were still allowed to sell cases of bottles. “Some of it was lack of knowledge and some were waiting to see if the town would enforce it,’’ Rask said. The 14 businesses were checked again last week and all were in compliance except Cumberland Farms, Rask said. “I am pleased to see that the vast majority of Concord businesses have decided to comply with the bylaw, regardless of the views about the merit of the bylaw,’’ Whelan said. Several Concord businesses oppose the bylaw, saying it is driving customers out of town and costing them money. Town Meeting approved the ban last April as a way to curtail the use of plastic and help the environment. Didier said he now offers single-serving cartons of water for sale, but they are not as popular as the plastic bottles, which he said are easier to carry and store in the car. “They are not very popular yet, but we don’t have a choice,’’ Didier said of the single-serving cartons. Eddie Haddad, manager of the Walden Italian Kitchen on Commonwealth Avenue, said customers are complaining about the lack of water in his drink cases. He said tap water is available, but some people do not like drinking water from a faucet. “They are drinking soda and some are bringing water with them,’’ he said. 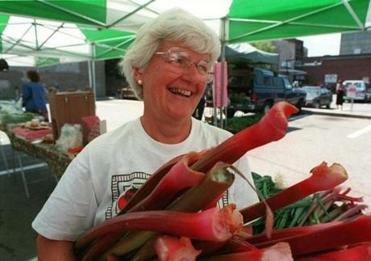 Joan Verrill, of Verrill Farms in Concord, holds a bunch of rhubarb at her stand. Joan Verrill, whose family owns Verrill Farm on Wheeler Road, said she has mixed feelings about the ban. She said she does not understand why more people will not drink water out of the tap. On the other hand, the farm stand used to sell a significant amount of water, so the ban has hurt business. “It was good income for us,’’ she said. Verrill said they still sell fruit juices, sparkling water, and soda. Customers can also get water from the tap, she said. Verrill said the farm may consider filling up a 5-gallon cooler in the spring and summer so customers can help themselves to water. But given the effect on business, Verrill said, she hopes the ban is overturned at Town Meeting this year. A group of residents submitted a citizens petition seeking to repeal the bylaw at the annual session in April. Not all businesses in town are opposed, however. Wade Rubinstein, owner of the ice cream shop Reasons to be Cheerful on Commonwealth Avenue, said the ban has not affected his business because he has never sold bottled water. He said he always has filtered water and cups available for his shop’s customers, and uses filtered tap water to make his sorbet. “The water out of the tap is great,’’ Rubinstein said. Jennifer Fenn Lefferts can be reached at jflefferts@ ­yahoo.com.